Yet one automated system for Oil Reclamation Shipped - ! Equipment for Transformer Oil Reclamation. GlobeCore. 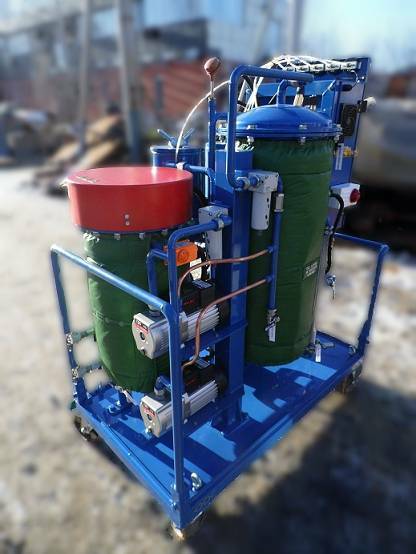 In 2014, GlobeCore supplied and commissioned an automated mobile plant CMM-0.6A for purification and drying of transformer oil. The unit uses classic vacuum drying process, as well as purification by multiple passes through a series of filters. The input oil’s viscosity must be below 70 cSt at 50 °С. The unit is fully automated. It features a GSM module for remote control of the unit by cell phone. Error messages and process parameters are transmitted to the cell phone as text messages. The CMM-0.6A unit will be most beneficial to facilities involved in installation, repairs and operation of transformers, oil-filled switches etc.